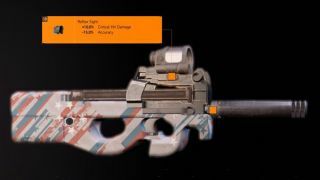 One of the most powerful weapons in the game is the Division 2 Chatterbox, the Exotic SMG that offers insane close range damage in The Division 2. Getting your hands on it isn't easy to do though because just like some of the other Division 2 Exotics, you have to pray to some random drops to obtain all of the Division 2 Chatterbox parts. If you want to grind towards the Division 2 Chatterbox parts, we've got everything you need. Read on for our complete guide to the Division 2 Chatterbox. The Chatterbox is a P90 SMG, which should be familiar if you've played other modern shooters. Before we get on to how to find this Division 2 Exotic SMG, let's take a look at the gun itself. What do the stats look like, what talents does it have, and overall, is the Chatterbox any good? Incessant Chatter: Every shot landed grants 1% rate of fire to a max of 60%. This rests on reload. Box Magazine: Kills with this weapon refill 20% of its magazine and grants a buff for 10s. While the buff is active, every shot landed increases magazine capacity by 1 to a max of 60. Killing a target consumes the buff to fully refill the increased magazine. Blabbermouth: While holstered, reloading your weapon within 5s after a kill grants 20% rate of fire for 10s. Essentially, the Chatterbox Exotic SMG has an endless source of ammo if you can kill enemies quick enough. Imagine using this in the upcoming Division 2 raid... you'll be unstoppable. Getting your hands on the Chatterbox is going to take some grinding and a healthy dose of luck. To start with, you have to find three parts to the gun, which are all random drops from Hyena crates. So the first thing you need to do is farm a lot of The Division 2 Hyena key locations, so you definitely end up with enough keys to open a bunch of Hyena crates. The first part of the Chatterbox you need to grab is the Loaded Canister. Each component is region locked, and the Loaded Canister can be found exclusively from Hyena crates in Downtown East. There's two Hyena crates during the Grand Washington Hotel mission, so go ahead and replay that a few times to loot them as much as possible. The first is in a small bathroom after clearing the lobby, and the second is to the right when you enter the rooftop. There's also another Hyena crate in the ground floor of the MLK Memorial Library under the stairs, but you'll need to wait 24 hours for this to reset each time. When you've got the Loaded Canister, it's time to look for the Creative Mag. This is found in the same manner; loot as many Hyena crates as possible, but this time it has to be inside Federal Triangle. The only Hyena crate we know of here is in the Jefferson Trade Center mission, in the loading dock at the end of the garage. Finally, you need to get the Modified Mods from Judiciary Square. We can't guarantee specific Hyena crate locations in this region of the map so you're going to need to have a search yourself, but we recommend tackling the District Union Arena stronghold a few times because you'll find a couple there. Now before you can combine the three Exotic parts, you need the Chatterbox blueprint. Head to Downtown West and play the Bank Headquarters mission on Challenging difficulty. A new crate will appear in the vault as long as you have the three components, and it will drop the Chatterbox blueprint every time. Now, simply head back to your Exotic crafting bench at the Base of Operations and craft that baby! Why not test it out on the Hunters; secret bosses that drop The Division 2 masks?